Verizon Wireless has made Android 4.3 Jelly Bean available to its variant of the Samsung Galaxy Note II. In addition to the system update, the new operating system brings with it support for the Galaxy Gear smartwatch. The update makes a wide number of improvements to the performance of the Note II, including battery life for Exchange users, Google Maps, Wi-Fi, and voicemail notifications. Apps can now be moved to the SD card. The PenUp and Multi-window functions have been updated to the same version that runs on the Note 3, the Sound and Shot feature works better, and Bluetooth Low Energy has been enhanced. The update is being pushed out over the air in phases. 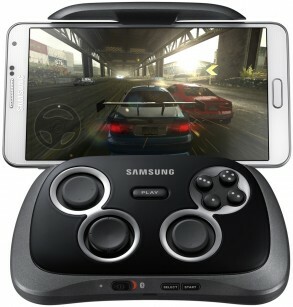 Samsung today announced the GamePad, a gaming accessory for its Android smartphones. The GamePad resembles a gaming control unit from today's living room gaming consoles. It supports a number of Samsung smartphones, cradling devices with screens ranging from 4 inches to 6.3 inches. It connects to smartphones via Bluetooth and an associated application. The GamePad provides physical controls for games, and connects to TVs through an HDMI cable or AllShare Screen Mirroring. The GamePad requires Android 4.3 Jelly Bean and Samsung recommends it be used with devices such as the Galaxy S III and S4, and the Note II and Note 3. The GamePad includes support for NFC for easy device pairing. The Mobile Console app for the GamePad is available for download through the Samsung App store. The Samsung GamePad is launching first in European markets with others to follow in the coming weeks. Samsung has not shared specific plans to offer the GamePad in the U.S. yet. Samsung today announced that its older smartphones can now interact with the Galaxy Gear smartwatch. Specifically, the Android 4.3 system update, which is being pushed out to some devices in other countries, enables compatibility between the Gear and the Galaxy S4, S III, and Note II. A separate, non-system level update will be delivered to the Galaxy S4 mini, S4 Active, Mega 5.8, Mega 6.3, and S4 zoom that enables the Gear. This separate update will be pushed out beginning later this month. Timing for each device will vary by country and carrier. Verizon Wireless has prepared an operating system upgrade for the Samsung Galaxy Note II. The upgrade boosts the OS to Android 4.1.2 and makes a number of improvements to the device's performance. It adds IPV6 to the mobile hotspot feature, improves Exchange-based email syncing, adds airplane mode notifications, fixes text behavior when in landscape mode, and makes some fixes to the calendar and back-up assistant. The update also removes the Zappos application, which was preloaded on the device. The system update can be downloaded and installed over the air, though Verizon suggests that Note II owners use Wi-Fi. It is being distributed in waves and users will be notified when their device is ready. Facebook today made Facebook Home, its new launcher and user interface overlay, available to select Android smartphones. Facebook Home replaces the stock launcher on the device with one that presents Facebook content, such as the news feed, on the home screen. Facebook Home is preinstalled on the HTC First, which also happens to go on sale today from AT&T for $99, but it can also be installed on the HTC One X, One X+, One, and Samsung Galaxy S 3 and Note II. Separately, Facebook also updated the Facebook Messenger application for Android devices. 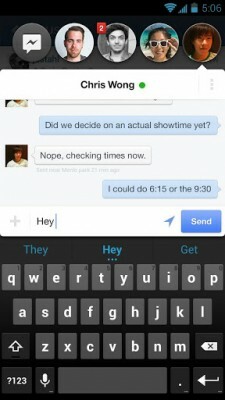 The revised Messenger app carries over one of the main features of Facebook Home, called Chat Heads (pictured). With Chat Heads active, Android device owners can keep conversations with friends always at hand by placing a little icon with the friend's head in it on the home screen. Both Facebook Home and Facebook Messenger are free to download from the Google Play Store. Samsung today provided information about a software update for the Galaxy S III. The Premium Suite is an add-on that includes a handful of new features such as a split-screen mode similar to the one on the Galaxy Note II. This will let the GSIII operate two different apps at the same time, each appearing in its own window on the display. Other features of the Premium Suite include better control over browser font size, contextual awareness (opens music app when headphones are plugged in, etc. ), and easier photo sharing via NFC. The Premium Suite is being rolled out to devices in other markets around the world first. U.S. carriers have not indicated when they might make the update available to their own customers. 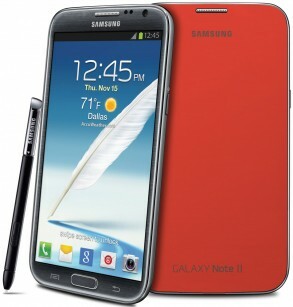 Verizon Wireless today announced that its variant of the Samsung Galaxy Note II will be available online and in stores beginning November 29. Customers who've preordered the device should be notified about their shipments soon, if they haven't already. The Note II costs $299.99 with a new contract. Apple has filed a request with the U.S. District Court for the Northern District of California in an attempt to add six more Samsung devices to an existing lawsuit against the Korean company. 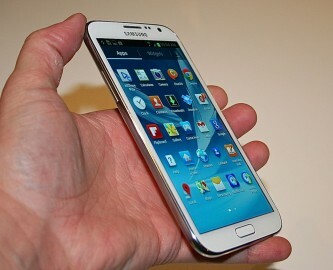 The new devices are the Galaxy S III, Galaxy Note II, Rugby Pro, and Galaxy III Mini, as well as the Galaxy Tab 8.9 WiFi and Galaxy Tab 2 10.1. Apple alleges that these newer devices infringe on many of the same patents it accused Samsung of violating in a lawsuit it filed in February of this year. Apple said that if it isn't allowed to add these device to the existing case, it will be required to file an entirely new lawsuit. This is a separate case from the one that delivered a guilty verdict against Samsung in August of this year. Verizon Wireless has made the Samsung Galaxy Note II available for preorder on its web site. It costs $299.99 with a new two-year contract and, according to Verizon, will ship by November 27. T-Mobile and Sprint have already begun selling the device, and it reaches AT&T stores November 9. 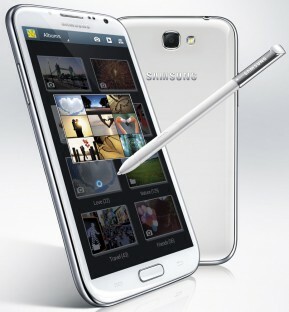 Samsung today announced that AT&T, Sprint, T-Mobile USA, U.S. Cellular, and Verizon Wireless will all sell their own variants of the Galaxy Note II. Samsung said that availability and price will be announced by each carrier separately, though it noted that all the carriers will offer the Note II by mid-November. It will run on the LTE 4G networks of AT&T, Sprint, U.S. Cellular, and Verizon Wireless, as well as the HSPA+ network of T-Mobile USA. The Note II takes the design language of the Galaxy S III and expands it to include a 5.5-inch display. It has a 1.6GHz quad-core Exynos processor, a redesign S Pen, and expanded S Pen apps. The Samsung Galaxy Note II doesn't have any U.S. carriers yet, but Phone Scoop spent some time with it anyway. Here are our initial impressions of Samung's latest phablet. Samsung today announced the Galaxy Note 2, which offers a larger screen than the original in a design that closely resembles the Galaxy S III. The Note 2 has a 5.5-inch Super AMOLED display with 1280 x 720 pixels. The original Note had a 5.3-inch display with 1280 x 800 pixels. The pixel measurements of the Note 2 give it a 16:9 ratio. Samsung has improved the S Pen itself (longer and thicker) as well as the S Pen apps and features on the device. For example, Air View allows users to hover with the S Pen over an email, image gallery, or video to preview the content without having to open it. It also adds Quick Command, which lets users open frequently used apps with a flick of the S Pen. The Note 2 will be driven by a quad-core Exynos processer at 1.6GHz per core mated to 2GB of RAM. The Note 2's main camera rates 8 megapixels and can capture 1080p HD video, while the user-facing camera rates 1.9 megapixels. They use back-side illumination for better low-light performance. Connectivity options include HSPA+ at 21Mbps and LTE, though Samsung has yet to specify which spectrum bands the Note 2 supports. The Note 2 will also include Bluetooth 4.0, Wi-Fi, GPS, NFC, MHL, a bevy of sensors and a 3,100mAh battery. Last, the Galaxy Note 2 will come in 16GB, 32GB, and 64GB variants, and offers a microSD card slot for additional storage. The device will ship with Android 4.1 Jelly Bean. The Galaxy Note 2 will ship in European markets first, but Samsung Mobile says a version for U.S. carriers will debut before the end of the year.